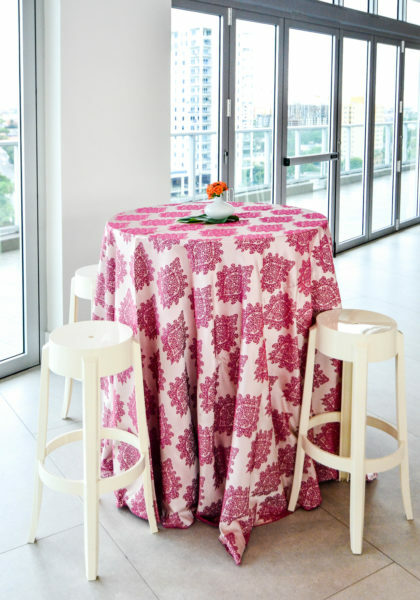 Style and Events In The Summer – How To Create A Gossip Worthy Party! What do these have in common? They make perfect accents for a summer party worth talking about! We sat down with Jessica Zeidler Rojas & Ashley Deoleo from our fab Design Team, to give you a sneak peek into our summer event style. 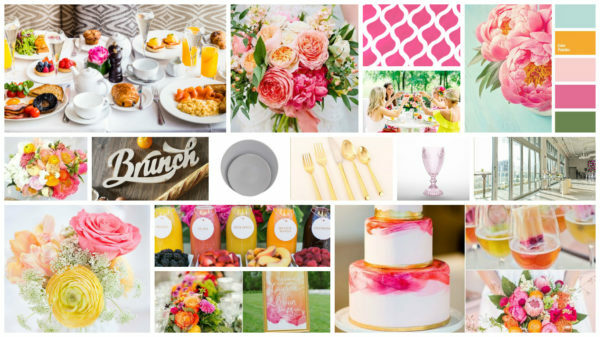 Bonus: we’ve got an inspiration board and photos from a recent summer event, to inspire your next party! Unicorn Swirls – The world has caught Miami-fever, and we’re loving it. Bright pastels and neon colors have really taken off this summer! Tablescapes, food, flowers and design elements have all pulled from the neon fashion trend. Need more evidence? Raise your hand if you’ve fallen victim to the unicorn craze (it’s ok, our hands are up too). Fuchsia and purple add a dose of warmth to your summer style palette, and transition well from day to night. Greenery – green hues are known for giving freshness to your design. This makes it easy to incorporate using beautiful plants and floral centerpieces with exposed stems. Add a few tall and gorgeous greens in beautiful planters to accent your next event. Not only will they provide eye-catching perimeter décor, but they serve as great room dividers and additional shade for lounge areas. Mood: Sunny – yellow is always a strong summer hue, thanks to the sun! Add a bright pop of color in your linens and flowers using yellow tones. For food, try incorporating dishes that use mango, passionfruit and lemons! 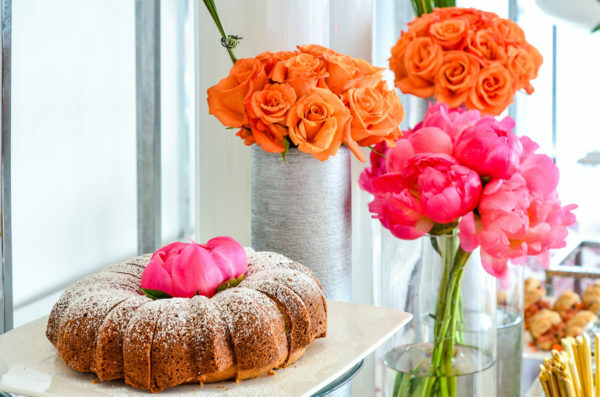 For easy accents to your tables, pick flowers that hold up well to the summer heat! 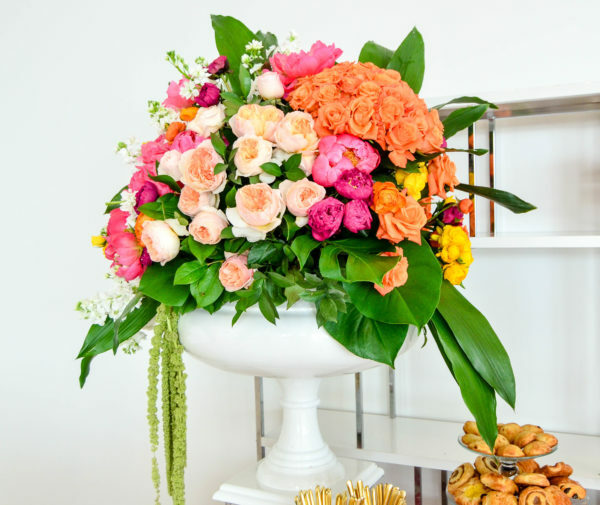 Think proteas, callas, succulents, tropical leaves and orchids – they’ll all hold up perfectly in a gorgeous vase. For a pop, add lemons or mix in pineapples to brighten the look. Since we’re talking summer – we hope you’ll be spending plenty of time near a pool because it is HOT! As a fun and interactive décor add-on for your next summer event, beach balls and pool inflatables are back and better for this summer’s event style. Flamingos, donuts, lemon slices, unicorns and even pizza have made the cut – they’re a huge hit! 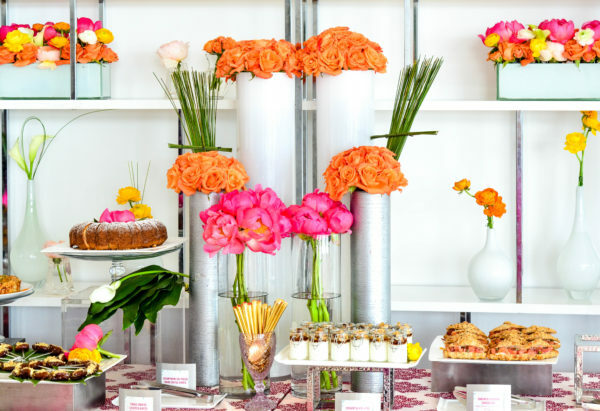 When designing your event theme, be bold for summer! Color blocking is back, and by pairing your bold color selections with a few key neutrals, you’ll be able to create a cohesive theme throughout. Check out our summer party inspiration board and real event photos below! Want more summer? Try out these Frozen Treats!